If Ireland was as densely populated as England, its population would be a staggering 35.5 million, slightly larger than Canada. 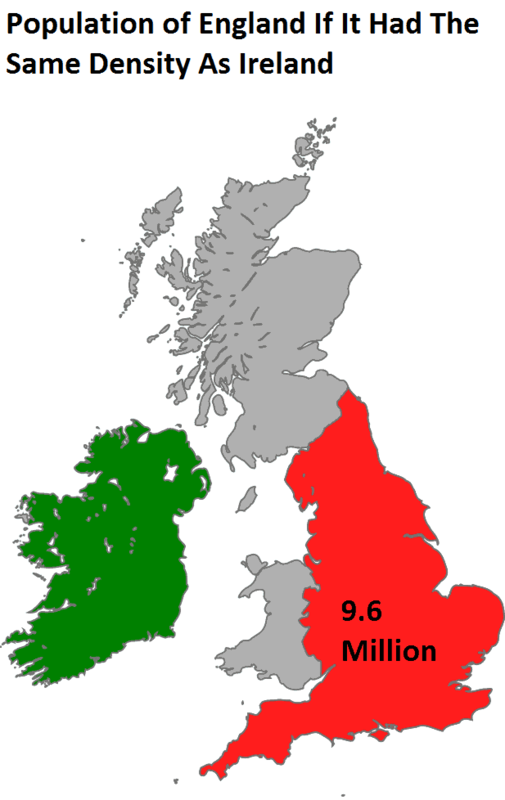 If England was as densely populated as Ireland, its population would only be 9.6 million, or slightly smaller than the Greater London Urban Area. Scotland would have 32.8 million people if it were as dense as England. Wales would have 8.7 million people if it were as dense as England. Northern Ireland would have 5.9 million people if it were as dense as England. The Republic of Ireland would have 29.5 million people if it were as dense as England. Find these maps interesting? Then please share them with a friend. Brexit is only of interest for England… The other parts of GB are victims. Well Wales did vote for it as well, so can’t really say they’re victims. And while we very strong oppose Brexit at MoverDB, this map is not meant to be a comment on it. If anything its a comment ongoing impact the Irish Potato Famine still has today. Wales are victims in the ‘Patty Hearst was a victim’ sense. Give it time, we are being flooded with migrants. England is a land of migrants. You can’t really say Ireland’s population density is explained by the potato famine. Ireland (especially southern) is far less fertile than England. Therefore, Ulster is far denser th an The Republic, and England is far denser than either. The potato famine is a symptom, not a cause. There is a reason the anglo-saxons invaded england and left the fringes to the natives. And why the Scots established plantations in Ulster, not the south. France’s population would be 270 000 000. Yep, pretty crazy to think about.